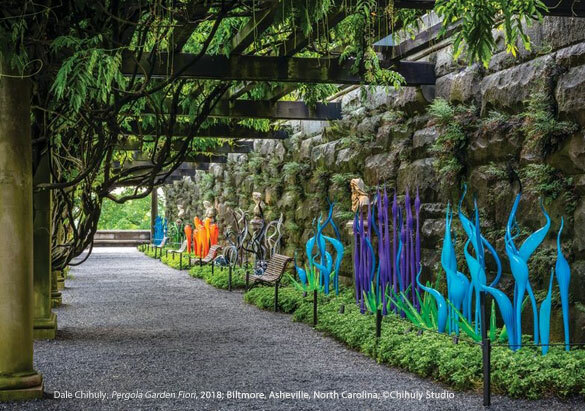 The dramatic art installations of Chihuly at Biltmore have drawn even more attention to Biltmore’s historic gardens—creating the ideal opportunity to take a closer look at these fascinating places. 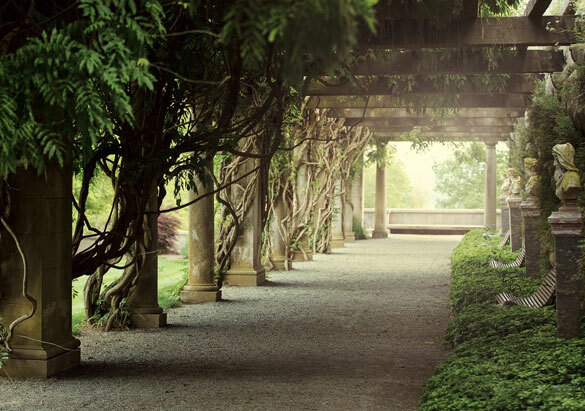 Beneath the wisteria canopy of the Pergola—along the base of the South Terrace next to Biltmore House—is a shady retreat filled with history. The Pergola once served as a resting place overlooking a lawn tennis court popular with Edith and Cornelia Vanderbilt and their friends. In 1919, Edith asked Chauncey Beadle, estate superintendent, to convert the original “lawn” court to a clay court; the court was later removed. 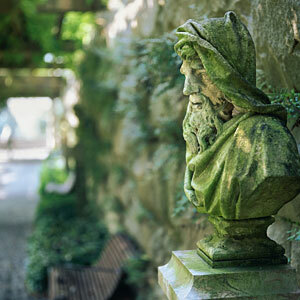 Now, this space offers a cool and quiet passageway to the Shrub and Walled Gardens and a location for four marble busts nestled along the stone wall. Look carefully to discover that the quartet represents the four seasons: Spring with flowers, Summer with wheat, Fall with fruit and grapes, and Winter with wind. The Pergola itself dates back to the construction of Biltmore House. Grading and construction began in 1891 under the direction of architect Richard Sharp Smith and landscape architect Frederick Law Olmsted. This archival photo shows the walking paths from the Pergola through the Shrub Garden and Walled Garden completed, with the Pergola underway and, in the distance, the Conservatory under construction. Limestone columns and massive wooden rafters form the structure that was originally crowned with ivy. 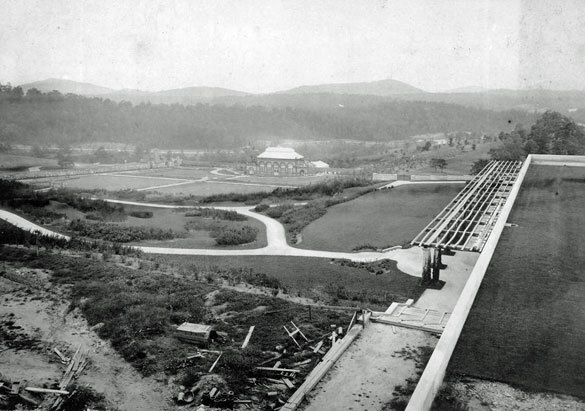 According to Bill Alexander, Biltmore landscape and forest historian, Olmsted specified English ivy to be planted at the base of the columns in 1892. 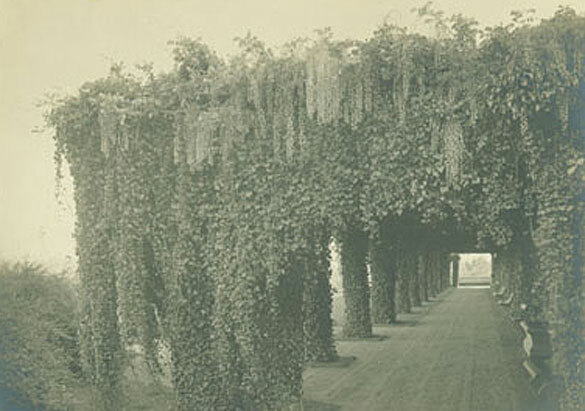 “This look of being ‘festooned’ with ivy was typical of Olmsted’s design intent,” Bill said. By 1895, wisteria was planted on the South Terrace and trained to grow out over the Pergola through gaps in the limestone wall created for this purpose. Nearly a century later, Biltmore’s landscape team removed the vines from the top to protect the walls from damage caused by roots, resulting in the leafy and peaceful setting enjoyed today.